UNC Asheville will celebrate the installation of its eighth Chancellor Nancy J. Cable, April 23-26, with a series of roundtable discussions, concerts, and a campus ceremony, offering opportunities for the Asheville and UNC Asheville community to come together in conversation and celebration. With the theme of Celebrate UNC Asheville! the events kick-off on Tuesday, April 23 with a faculty and student Undergraduate Research Day in classrooms and public spaces across campus, including poster and presentation sessions in the Wilma M. Sherrill Center. This all-day symposium is free and open to the public, featuring hundreds of undergraduate research and creative project presentations by UNC Asheville students. The Celebrate UNC Asheville! events continue on Wednesday, April 24, at 3 p.m. The UNC Asheville Student Government Association will host an afternoon concert on the Quad featuring campus musicians. At 4 p.m., the community is invited to celebrate UNC Asheville’s designation as a Tree Campus USA by the Arbor Day Foundation with a tree naming in honor of UNC Asheville’s eight chancellors. These events are free and open to everyone. The evening of April 24, UNC Asheville will host a celebration of invited corporate, educational, governmental and nonprofit leaders in Asheville and Buncombe County at a private gathering featuring Grammy-award winning singer songwriter Kathy Mattea. The celebration continues on Thursday, April 25, at 11 a.m. with a special naming ceremony of a room Highsmith Student Union in honor of the Eastern Band of Cherokee Indians and its lasting partnership with UNC Asheville. The ceremony for the ᏙᎩᏯᏍᏗ (To Ki Ya Sdi) room will take place in the renovated Highsmith Student Union, Room 238. A series of roundtable discussions on key issues in higher education will take place Thursday in Highsmith Student Union, Blue Ridge Room, highlighting the Celebrate UNC Asheville! theme. Liberal Arts and Science Education’s Vital Role for the Future of our Democracy will be held at 9 a.m., led by Jon Peede, chair of the National Endowment for the Humanities, Dr. Lynn Pasquerella, president of the Association of American Colleges and Universities (AAC&U), and Dr. Lawrence T. Potter, chief academic officer and provost at the University of the District of Columbia. UNC Asheville faculty respondents include Dr. Patrick Bahls, Honors Program director and professor of Mathematics; and Dr. Lyndi Hewitt, Sara and Joseph Breman Professor of Social Relations and associate professor of Sociology, and Women, Gender and Sexuality Studies Program director; and Dr. Keya Maitra, professor of Philosophy and the Thomas Howerton Distinguished professor of Humanities. An Essential Right: Health and Wellness Trends & Research will be held at 2:30 p.m. with Dr. Rita Charon, founder of Narrative Medicine; Dr. A. Wesley Burks, CEO of UNC Healthcare, and Dr. Jeff Heck, president and CEO of MAHEC. UNC Asheville faculty respondents include Dr. Ameena Batada, associate professor of Health and Wellness; Dr. John W. Brock, Associate Professor of Analytical Chemistry and Toxicology; Dr. Amy Lanou, chair and professor of Health and Wellness and executive director of the North Carolina Center for Health and Wellness; and Dr. Ted Meigs, GlaxoSmithKline Professor of Molecular and Chemical Biology. Inclusive Excellence and Equity: The Power of a University Partnership will be held at 4 p.m. led by Al Whitesides, Buncombe County commissioner; Debra Campbell, city manager for the City of Asheville; Kimberlee Archie, equity and inclusion manager for the City of Asheville; Dr. Lawrence T. Potter, chief academic officer and provost at the University of the District of Columbia; and Frank Goldsmith, retired civil rights attorney and board member of Carolina Jews for Justice West. UNC Asheville faculty respondents include Dr. Trey Adcock, assistant professor of Interdisciplinary Studies and director of American Indian and Indigenous Studies; Dr. Agya Boakye-Boaten, chair and associate professor of Africana and Interdisciplinary and International Studies; Dr. Tiece Ruffin, associate professor of Education; and Dr. Darin Waters, associate professor of History and executive director of Community Engagement. Thursday evening culminates with a public lecture by attorney, best-selling author and activist Bryan Stevenson at 7 p.m. in UNC Asheville’s Kimmel Arena as part of the David and Lin Brown Visionary Lecture Series and The Van Winkle Law Firm Public Policy Lectures. Stevenson is the founder and executive director of the Equal Justice Initiative (EJI) and its National Memorial to Honor Victims of Lynching. EJI aims to end mass incarceration and excessive punishment in the United States, challenge racial and economic injustice, and protect basic human rights for the most vulnerable people in American society. He also is the author of the New York Times best-seller Just Mercy: A Story of Justice and Redemption. The talk is free and open to everyone, with the doors of the Wilma M. Sherrill Center opening at 6 p.m. Celebrate UNC Asheville! continues with community stargazing at 8:30 p.m. at the university’s Lookout Observatory. The Celebrate UNC Asheville! key higher education issue roundtable discussions continue on Friday, April 26, in the Ingles Mountain View Room in the Wilma M. Sherrill Center. The American Dream: Interfaith Leadership in a Religious Democracy will take place at 9 a.m. led by Dr. Eboo Patel, founder and president of Interfaith Youth Core, and Rhodes scholar whose most recent book is Interfaith Leadership: A Primer. UNC Asheville faculty respondents include Dr. Rick Chess, Roy Carroll Professor of Honors Arts and Sciences and director of the Center for Jewish Studies; and Dr. Rodger Payne, chair and professor of Religious Studies; Dr. Kate Zubko, associate professor of Religious Studies, NEH Distinguished Professor in the Humanities, 2018-21; and Dr. Marcus Harvey, assistant professor of Religious Studies. The Melting of the Arctic Permafrost: Climate Implications will take place at 10:30 a.m. led by Dr. Robert Max Holmes, deputy director and senior scientist with the Woods Hole Oceanographic Research Institute. UNC Asheville faculty respondents include Dr. Evan Couzo, assistant professor of STEM Education and coordinator of 6-12 Mathematics Licensure; Dr. Dee Eggers, associate professor of Environmental Studies; Dr. David Gillette, associate professor of Environmental Studies; and Dr. Andrew Laughlin, assistant professor of Environmental Studies. At noon on Friday, April 26 the campus community and guests are invited to lunch at UNC Asheville’s Brown Hall and Highsmith Student Union. Chancellor Cable will be formally installed as UNC Asheville’s Eighth Chancellor in a special ceremony on the Quad on Friday, April 26, at 3 p.m., joined by local legislators, UNC System leaders, higher education colleagues, friends and the campus community. Author, educator and interfaith leader Dr. Eboo Patel will give the invocation, with Dr. John J. DeGioia, 48th President of Georgetown University, giving the installation address, and Dr. John Kuykendall, president emeritus of Davidson College will offer the benediction. Delegates from public and private colleges and universities, and representatives from the Board of Governors and legislature will also participate. The ceremony is free and open to the public. 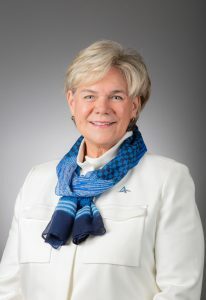 UNC Asheville’s Eighth Chancellor, Dr. Nancy J. Cable, is a nationally recognized leader in higher education, educational access, financial aid and affordability, and liberal arts and sciences curricula. She holds a B.A. from Marietta College, a M.Ed. from the University of Vermont, and a Ph.D. of Philosophy from the University of Virginia, and joined UNC Asheville in August 2018, after serving as the president of the national philanthropy Arthur Vining Davis Foundations. She brings to the university a depth and breadth of experience in leadership roles at both public and private institutions, in generating external resources for the enhancement of the university and in facilitating the implementation of an ambitious academic and co-curricular strategic plan. For more information about these events and to RSVP for the ceremony, visit https://www.unca.edu/installation/.